“So it is with Christ” – a look at how you fit in the body of Christ. 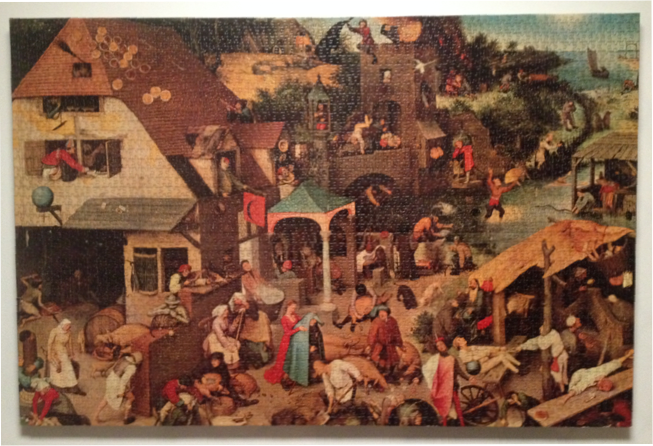 At home I have on the wall a jigsaw puzzle I received when I was 15 – with 3000 pieces. Because it took me so long to complete, I glued it to a board and hung it on the wall. Each piece of this puzzle, on its own, is not much to look at. You would never be able to tell what the big picture is by looking at just one piece. However all together they form a beautiful picture worthy of hanging on our living room wall. There is something wrong with this jigsaw puzzle though. In the process of several house moves, one piece on the bottom left hand corner has come off, and has been lost forever. (Bizarrely, it also happens to be the face of an unfortunate man being strangled by a grumpy, Monty Python-esque woman). Most people who see it don’t notice, but because I know it’s missing, and because I spend countless hours building the picture, I always feel slightly disappointed when I look at it, and I always notice the empty spot. Without this piece, the Jigsaw is incomplete. What point is he making? When we see Jesus referred to as ‘Christ’ (or ‘Christ Jesus’) the emphasis is not so much on the person, as on the office he fulfilled – the Christ, or Messiah. He is speaking here not about my personal relationship with the Father through Jesus, but my participation in the revolutionary change that Jesus has made by coming as the Messiah – the promised king who would be the fulfilment of all of God’s promises, beginning with Abraham, to bring blessing to every nation on earth. We are part of something much bigger than our local church or neighbourhood – this is something with global implications! ¹³“I saw in the night visions, and behold, with the clouds of heaven there came one like a son of man, and he came to the Ancient of Days and was presented before him. What good is a king unless He has citizens in His kingdom over whom He rules? The arrival of the King means peace, security and prosperity for those living under His rule. Jesus came not only to assert God’s rule over the universe, but to restore human beings to the position we were given in creation – rulers over all that God has made. In the book of Revelation, almost every time Jesus appears in the visions, he stands side-by-side with those whom he has redeemed by his blood. And so to talk about Jesus as the Christ/Messiah means understanding that He is the king over His people, who are the ‘Messianic Community’. This is why Paul says here that the unity and diversity in the human body is a picture of ‘Christ’. Jesus has redeemed people from every tribe and tongue and nation, from every strata of society and walk of life. His gathering us together is about much more than creating a community in which we feel comfortable and supported; this is His plan to establish the Kingdom of God in every corner of creation and to bring every creature in heaven and earth to a place where they bow the knee and declare Jesus is Lord to the glory of the Father. The way in which the Messiah was promised to restore God’s people to live under God’s rule was to pour out the Holy Spirit, not just upon leaders, but upon every person. The fulfilment of this promise began on the day of Pentecost. Jesus’ death and resurrection was not an end in itself – it was with this aim. By paying for our sin and redeeming us from the judgement of death He has now made us into a suitable dwelling place for His Spirit. He died for you so that He may fill you with His Spirit. That is why Paul goes on in verse 13 to talk about the work of the ‘One Spirit’. In the first half we are in the Spirit – ‘In one Spirit we were all baptised,’ and in the second half the Spirit is in us – ‘all were made to drink of one Spirit.’ We are a ‘Spirit saturated’ people, and He brings a profound unity that cuts across race and social status – probably the two biggest things that have divided – and continue to divide – human beings throughout our history. The cross has broken down the dividing walls of hostility that human beings build between ourselves, by destroying the wall of hostility that was there between us and God. This is a radical thing, and is contrary to the way the world sees reconciliation. The root cause of human division is the fact that we are in rebellion against God – we want to take His place; to become God, ourselves. And when two or more people, each of whom wants to be God, meet each other, there is going to be conflict. So the solution to human hostility is not to try to work it out between each other, but for each to be first reconciled to God. Only then will we be able to come in humility, together before the cross, and be unified. We live in a country – a world – that is always threatening to fall apart through division and hostility, as each person and each group tries to assert their rights over and against others. The work of Christ is the only way in which people who hate one another can be brought to truly love – because they know that God first loved them. And the Church is designed to be a showcase of this blood-bought unity. As the church we may at times fees small, insignificant and ineffective. We may hear the world tell us that we are out-of-date, irrelevant and obsolete, and that we have nothing to say to them. We may hear them accuse us of being divided and hypocritical. However Jesus said that the Kingdom of God is like a mustard seed – a tiny, seemingly insignificant seed which, when planted, grows and exceeds all expectations by becoming a large tree that overshadows the entire garden (the mustard plant is normally a shrub, not a tree!) (Matthew 13:31-32). As we gather each Sunday, and as participate in the life of our church week by week, we are participating in something that has universe-changing implications. We cannot and should not ever understate the privilege it is to be a part of what God is doing through Jesus the Messiah. If you ever wake up on Sunday morning, or come home from work before your evening home group, feeling discouraged or without motivation, wondering if church is worth the effort, simply remind yourself that you are part of God’s total universe restoration project; the freedom of all creation will be accomplished by God through your freedom in Christ. ‘You (plural) are the body of Christ’ – the big picture. ‘Individually members of it’ – the phrase in Greek means ‘you have a share as members’ – something like shareholders in a company are all joint owners of the company – not a customer, but an owner. Without each shareholder, the company is not complete. God says that each of us is just as important as everyone else in completing the big picture of what He is doing in this world through Jesus his Messiah. He is sovereign over all things, and so our failures will not ultimately ruin his plans – however, why would we not want to be a part of this exciting work that He is doing, into which he invites us to be a part – to be shareholders? Following this passage is the famous chapter on love – 1 Corinthians 13. Most often we may hear it quoted in the context of a wedding, however it is really about us loving and serving one another in the church. And it is is the key to all of this. You may not yet have a clear answer to the question, ‘What role am I to play in the life of the church?’ but you can be sure of one thing: God is calling you to this: to love one another. This is to be our main focus, over and above the specifics of tasks and jobs. If we focus on loving one another as Christ loved us – by laying down His own life for us – then we will find ourselves beginning to fit into the place Jesus has for us in His church. Really thoughtful and helpful….thank you James, for following the leading of the Spirit and writing this blog! Praise God!